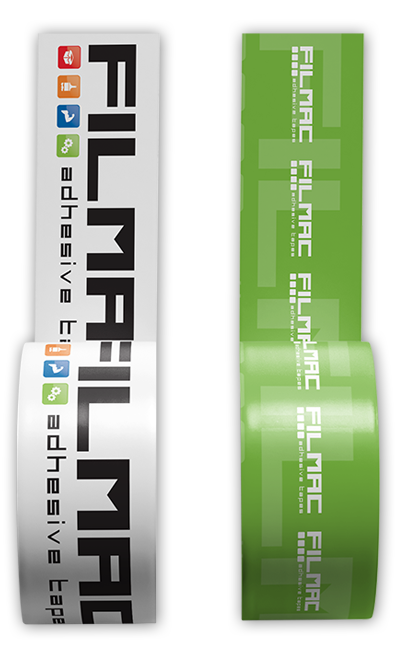 Our company was established in 1975 and his main activity was marketing and production of adhesive tapes. The society evolution towards a focus of environmental protection led to us to an eco friendly technology. A new production unit was born in 2000 in Cabiate with modern lines of coating, cutting and packing. In the latest years we added a new flexographic line for “sandwich print “and a new hot melt coating line. an alternative to petroleum-derived materials for a better world. PLA offers multiple options in terms of the end of life. 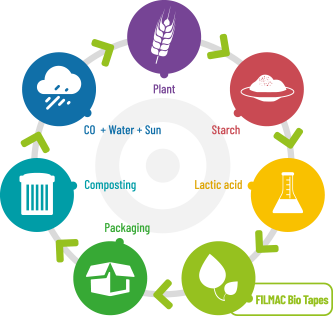 Besides landfilling, there are other solution which allow to recover the energy value of PLA and minimize the impact on our environment. 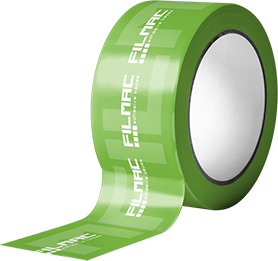 Once converted into packaging FILMAC BIO TAPES film can be industrially composted an will disintegrate in six months into C02, water and humus, a soil nutrient FILMAC BIO TAPES can also be mechanically and chemically recycled, as well as incinerated. a PLA bioplastic made from dextrose manufacturing generates 80% LOWER GREENHOUSE GAS EMISSIONS than traditionally plastics. Our continuous growth over time allowed us to achieve a policy of constant technological innovation. The synergy between our team and the technological capital built up, let find solutions to the different needs by offering quality products at moderate prices. 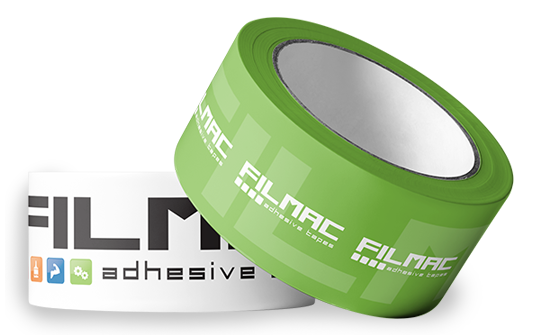 Our production can rely on two technologies of adhesive coating. Acrylic dispersion: polymers emulsified or dispersed in water with the possible addition of additives. Synthetic rubber: melting and mixing rubber and resins in hot, and natural hydrocarbonic, with the possible addition of additives. 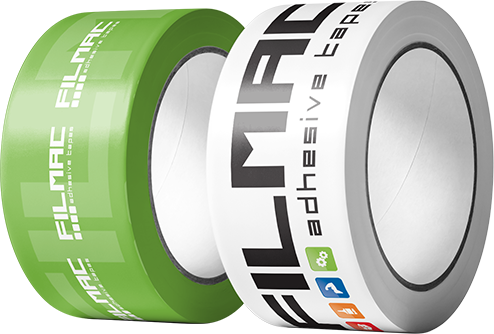 Today, with new installations, FILMAC is able to offer a wide range of products, in addition to packing tape, produces masking tapes, fixing and special, offering professional solutions to the most complex applications. Globalization and running technological innovations has changed our thinking and working speeding up needs and requirements. Our engagement is to reply quickly and efficiently to the demands looking at the service and quality like our priorities. We implemented our chain production making it faster, more flexible and almost completely vertically integrated with machinery and equipment of the last generation. The production process has been ensured by a dedicated control of he processing requirements and of the product too. We produce observing the laws in terms of safety and with a quality management system in line with the UNI EN ISO 9001: 2015. Our best and fascinating challenge concerns the research and development of new products . In order to grow up more and more we invest in expanding our Quality Control laboratory. Today, more than making monitoring of the measurement systems, compliance audits and quality control it is imperative engaged itself in the research and development in order to obtain product innovations for various application needs.. The increasing demand is putting under strain our planet. We consume more than the Earth can restore. Sustainability is therefore basic for our future, we need to combine economic success, social responsibility and respect for the environment. It is our commitment to minimize the environmental impact of our chain production with a continuous and accurate monitoring of emissions and processing waste to arrive an almost total recycling. To increase and maintain over time our commitment we are implementing our management and control system in accordance with UNI EN ISO 14001: 2015. Innovation means pay attention to research and development, making constant investments in one’s firm in order to achieve technologically advanced products. 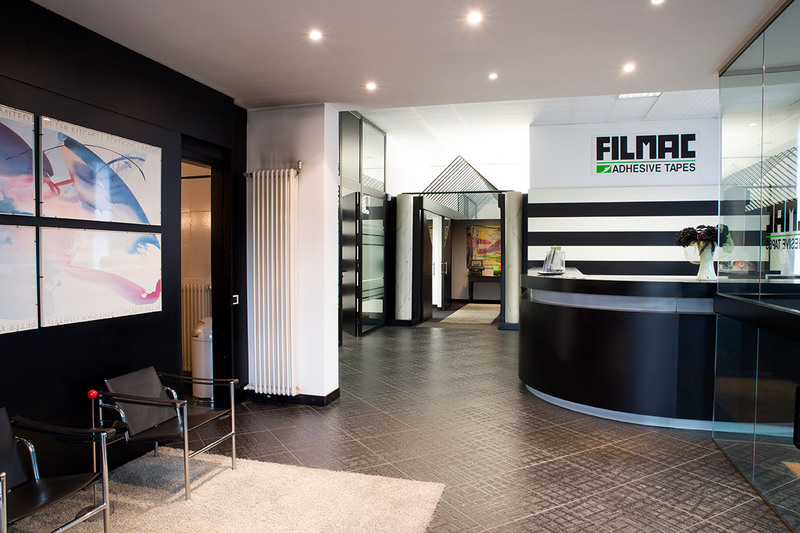 In response to a continuous marker demand for a qualitative standard, FILMAC proposes the ‘Sanwich print’, a process which allows us to insert the ink between film and adhesive; this make particularly clear, bright and indelible prints obtained.